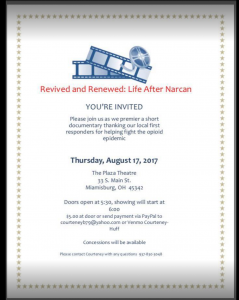 Revived and Renewed: Life After Narcan is a documentary on how a group of addicts were saved by narcan and the first responders who made it possible. The Exchange Club of Dayton presented certificates to EMT/police first responders to acknowledge their appreciation for their efforts that went above and beyond expectations. 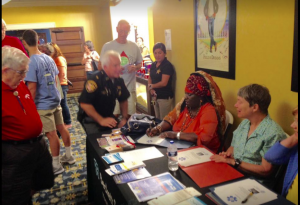 The club honored first responders for their dangerous work helping fight the opioid epidemic at the premiere of the documentary Revived and Renewed: Life After Narcan. 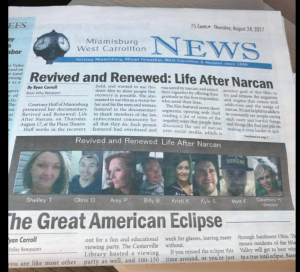 Kyle Shaw, Kristi Keller, Amy Parker, Shelly King Thompson, Billy Brokschmidt and Chris Osborne: the people saved and featured in the documentary.